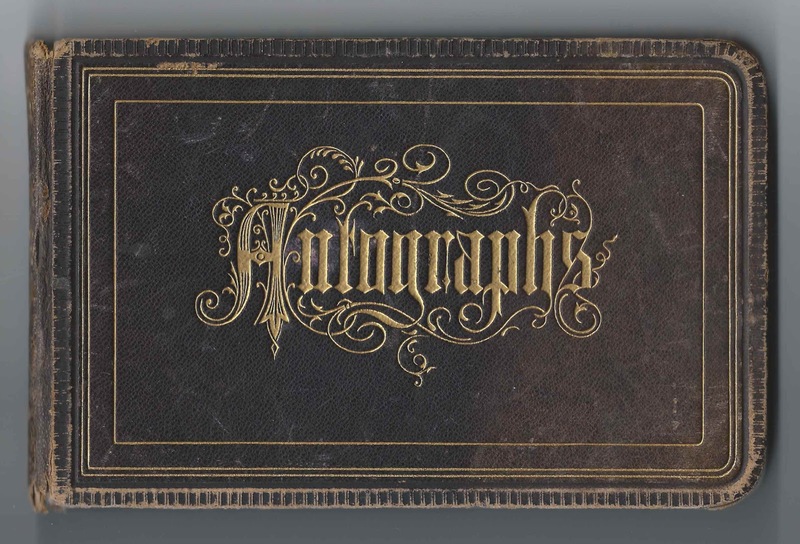 1880s/1890s autograph album of Lottie W. Caswell of Lakeville, Massachusetts. Many of the signers appear to have been Lottie's schoolmates, perhaps at a post-secondary institution. The album is approximately 7-3/4" x 5" and contains the sentiments of 100 of Lottie's friends, schoolmates and relatives. An alphabetical list of the students appears at the end of this post. Charlotte W. Caswell was born 7 June 1863 at Lakeville, Massachusetts, the daughter of Horatio Leonard Caswell and Sarah (Caswell) Caswell. Some of the signers mentioned initials, B.S.S.W., that might have referred to a school they attended, presumably with Lottie. 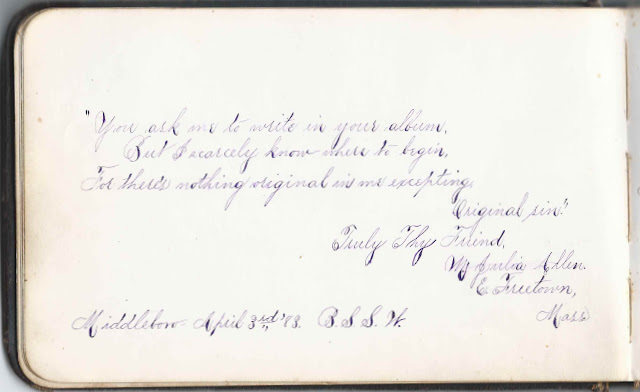 For instance, Julia Allen of East Freetown, Massachusetts, signed a page at Middleboro, Massachusetts, on April 3, 1883, and included B.S.S.W. Whether Lottie ever used her education in a profession or not, I don't know. The 1900 Census of Lakeville, Massachusetts, listed hr as living with her parents, with no occupation. Several people with the surname Caswell signed pages in Lottie's album. Some were perhaps her cousins. 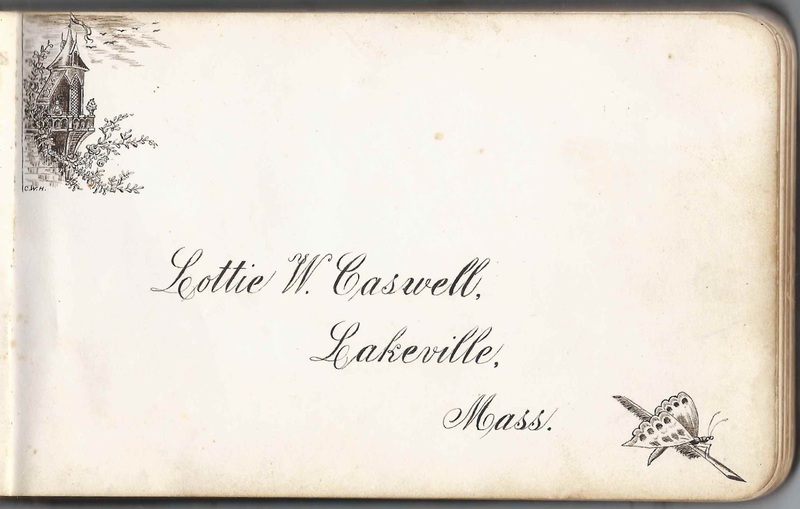 Winnie Caswell of Lakeville, Massachusetts, signed a page on April 14, 1884. Annie C. Caswell of Middleborough, Massachusetts, signed a page on April 15, 1883. 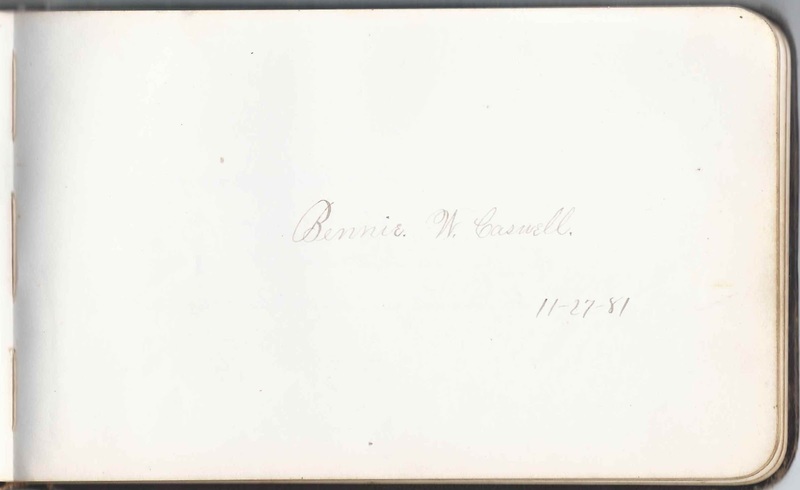 Bennie W. Caswell signed a page on November 27, 1881. On 28 July 1901 at Lakeville, Massachusetts, Charlotte W. Caswell, "Lottie", became the third wife of Bowers L. Haskins, son of Franklin Haskins and Eliza Reed (Lothrop) Haskins. His previous wives were Mary Eliza (Caswell) Haskins, with whom he had a daughter Nettie F. Haskins, born in 1872, and Abbie G. Dill. I don't believe that Lottie had any children of her own. Bowers died in 1928, and Lottie in 1943. M. Julia Allen of East Freetown, Massachusetts, signed at Middleboro, Massachusetts, on April 3, 1883, B.S.S.W. Abbie C. Bennett of North Rochester, Massachusetts, signed on April 8, 1883; B.S.S.W. S. Jennie Braley of Long Plain, Massachusetts, signed on April 8, 1883; B.S.S.W. Isa V. Canedy of L. M., signed on April 19, 1883; L. M. was possibly Lakeville, Massachusetts, and the signer may have been Isabella V. Canedy. Alternatively, the given name could be Ira. Edith M. Chandler of Middleboro, Massachusetts, signed on April 13, 1883; B.S.S.W. 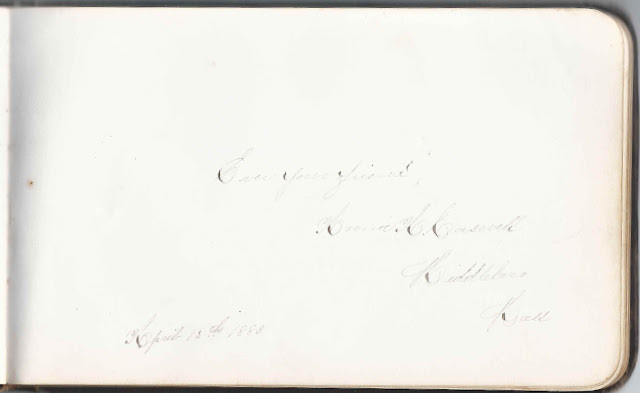 Annie A. Copeland of West Bridgewater, Massachusetts, signed on April 10, 1883; B.S.S.W. Alice A. Cummings of Taunton, Massachusetts; B.S.S.W. 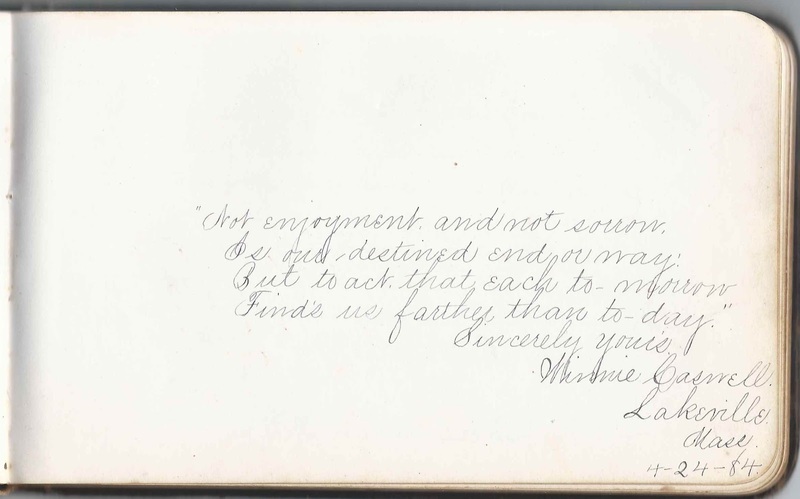 Fannie L. Fowler of Middleboro, Massachusetts, signed on May 11, 1893. In one corner: H.S.H. H. Adrie Haskins of Lakeville, Massachusetts, signed in August 1881. Presumably Harriet Adrienne Haskins, daughter of Bartlett and Harriet Haskins. Abby C. Haslet of Central Square, signed in the summer of 1881. Nettie Macomber of East Freetown, Massachusetts, signed on April 8, 1882. B.S.S.W. Hattie L. McCollough of Medford, Massachusetts, signed on October 13, 1883. "I will always remember Charlotte. Mamie and Baby Belle McCollough of Medford, Massachusetts, signed on October 13, 1883. "So Lottie will not forget us." Blanche Packard of Bourne, Massachusetts, signed on "5-12-95"
Alice Sawyer of Holyoke, Massachusetts, signed at Lakeville, Massachusetts on February 8, 1887; middle initial could be W or H or ? J. Washburn of Lakeville, Massachusetts, signed on June 13, 1888; middle initial might be S. or ?